Yes, I'm obsessed. Ponchos can really pull together any outfit while looking effortless. They are my go to when I'm running out the door and crunched for time...which is pretty much everyday. This one is my favorite because not only is it reversible, but the color can be worn year round. So for a piece you can keep in your closet all year, this is your guy. 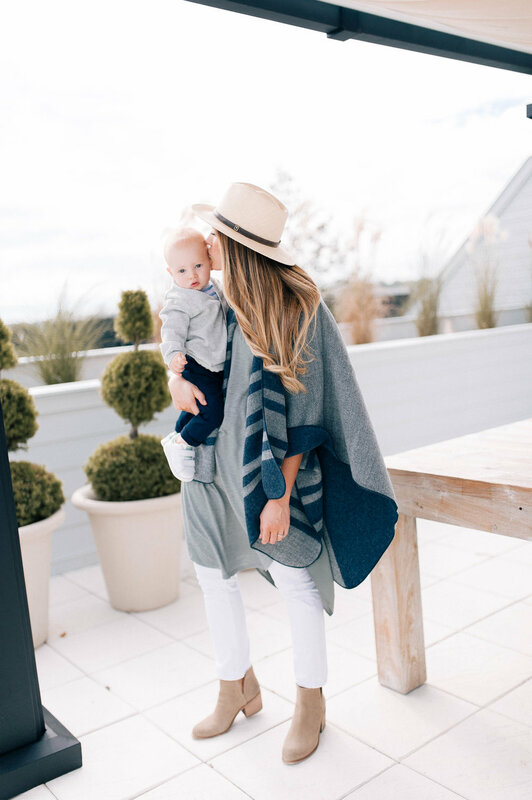 It's also the PERFECT piece for a breastfeeding mama! I have been living in these booties for the last month. They are not only comfortable, but they go with everything and are on sale. For Charlie's look, I mean what is cuter than a button down cardigan on a one year old? That paired with Stan Smiths, he's going to be a heart breaker.